It's been a fantastic year for the science-fiction genre of moviemaking, both on a grand scale (James Cameron's Avatar) and on a stripped-down, independent level (Duncan Jones' Moon). We've seen the clout that billows within social critiques and mental endurance tests in these pictures, some of which hark back to the pre-Star Wars days when depth and brains were emphasized more than dazzling special effects. Obviously, I'm referring more to Moon than to Avatar with that statement. 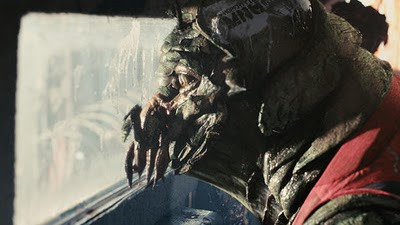 However, there's one picture that stands out from the pack as the crowning achievement from this year, one that blends credibly impressive special effects, pensive notions, and a smattering of boisterous action sequences: Neill Blomkamp's District 9, a budget-minded picture powered by Peter Jackson's Wingnut Films. It begins with archive footage from 1982, catching us up to speed on everything that's happened in South Africa after a spaceship comes to a stand-still above the city of Johannesburg. The aliens began hovering -- not invading, simply hovering -- because their ship malfunctioned, demanding an investigation that led to a humanitarian effort for the aliens. After a while, however, this resulted in mass panic and segregation that led to the creation of District 9, a mainland refugee camp that transformed into an anarchistic slum. Violence ensued, fear erupted in the mainland citizens, and a sense of vicious scavenger mentality sparked in the alien "prawns". 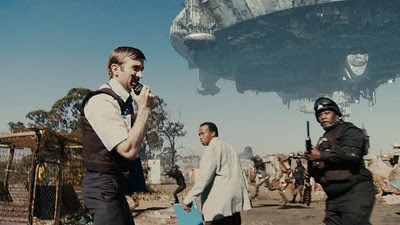 With safety issues simmering out of control due to their activity, it's been decided roughly 25 years later that Multinational United (MNU), with the assistance of a privately-funded police organization and Wikus Van De Merwe (Sharlto Copley) spearheading, would relocate the 1.8 million visitors to District 10, a smaller, much further out-of-the-way camp. To say that District 9 finds firm footing as a political critique, especially one that fixates firmly on South African apartheid, is an understatement. It can be felt with the first taped footage of the malnourished and mistreated prawns, resonating further as the comparison between them and the exploitation of humankind strengthens. With that idea firmly in his sight, director Blomkamp makes use of a relatively small budget -- $30million -- to create a documentary-style picture that brings dabs of science-fiction influence together into something polished and original, all within a gritty atmosphere. It's a powerful film where the content could stand on its own as a compelling sci-fi piece, even with the political metaphors stripped away. At first, it appears as if District 9 will be something of a ground-level critique on humanitarian issues, with a bit of science-fiction flare powering it along. The camera follows Wikus and his militant entourage as he gets eviction signature after signature from the residents, some with violent resistance and others, like Christopher Johnson and his child, that battle him on an intellectual level. Johnson happens to be a ring leader of sorts for the prawns, obvious by his intellect, as he tries to organize a way to cultivate fuel for his ship so that he and his kind might return home. The rest are more foot soldier types with lower mentalities, and the process in following Wikus in a guerilla-style fashion as he forces eviction softens our image of them -- crafting these creatures into organisms that really aren't given much choice behind their existence on this earth. That's where Image Engine's computer-generated effects earn their weight in District 9, as the prawns are actually able to grasp our emotions and, very easily, pull our affection towards them as living entities. Each one looks similar to a hybrid between a grasshopper and a shrimp, with small limbs and antennae moving about at several points on the body, and Blomkamp's not shy about letting the camera focus on their designs. Their tangibility is remarkable, heightened in conjunction with WETA Workshop's physical effects. Simple elements like a prawn barfing up black fluid and ripping a human limb from the socket never lead us astray from the film's aims, which pairs with long-lens vista shots that incorporate visualizations of the mother ship that make Independence Day's aerial effects pale in comparison. District 9 shifts gears at this point from its graphic yet sober introduction -- a combo between character introduction to Wikus and a bang-up summary of the elements we need to know about, including Voodoo-like spirituality, the underground market, and the military profiteering surrounding their weaponry -- to an almost horror-like breakdown once Wikus undergoes a biological alteration. His transformation looks back to David Cronenberg's The Fly for grotesque influence (along with a little bit of the video game Dark Sector), yet the metamorphosis grasps at emotional gravity because Wikus is transforming into the very thing that he's been harshly trying to push away from Johannesburg. Witnessing his fear in losing everything he's obtained, including his beautiful and understanding wife, becomes both an anxious experience and a well-deserved deconstruction because of his harshness to the prawns. All of this only works because of Sharlto Copley's performance as Wikus. He doesn't quite start off as successful, though: at the beginning of District 9, his character teeters over into a slightly caricaturist territory with his quirkiness. It's likely another potshot from Blomkamp at blunt-headed government types, yet his oddity comes across as slightly fake at the beginning. However, just as soon as Wikus suffers from his accident and begins the Jeff Goldblum-like crumble, Copley grabs the reins and pushes furiously ahead with wild eyes and desperate angst -- especially once the character can't trust anyone around him any longer. He grapples the character, an untrustworthy and intriguingly multilayered rascal, with admirable energy. It's obvious why Blomkamp stuck with his high-school friend Copley for this role, because he really pulls off the level of tooth-pulling, skin-ripping mania that we'd expect from this transformative being. District 9 boils to a violent rage in its third act, bringing everything together from its brilliant start into a blitzkrieg of science-fiction action that'd make the likes of Aliens and Robocop proud. Clear influence can be seen from those pictures, especially in a mech-like device used in it, but it also amply handles gunfire and explosives to astounding degrees. At first, it doesn't seem like Blomkamp quite has this level of volatility behind his filmmaker's eye, but as he sends bullets blazing in firefights in the final hours of Wikus' scramble through the slum -- as well as a few lightning bolts and electrical charges from alien weaponry -- he proves us wrong. And, for good measure, he incorporates a flicker of humor involving swine revenge, some cattle-prodding at official-level hypocrisy, and the lion's share of thoughtfulness about humanity's complexity. And, in so many words, District 9 is a work of high-brow, low-budget genius because of its multifaceted successes, enthralling and engaging in just about every way imaginable. The most impressive thing about it all is that it stems from a 6-minute short, Blomkamp's "Alive in Joburg", and comes stitched together as the product of a freshman feature-length director. There's a level of polish about its construction that's hard to believe; sure, it comes with influence from one of the reigning bigwigs of high-dollar productions, Peter Jackson, but the punch behind its allegorical narrative and well-pitched performances achieve a higher caliber of proficiency than expected. That can be seen all the way until its rather clever conclusion, one that can both allude to a second part of the story or end with a sense of anxiety and weighted emotion in our chests. For our sakes, I hope we're able to see more of Blomkamp's sharp eye for politico sci-fi splendor, because his tale of District 9 is luminous.